Jack Mowgley is not ordinary. How many police officers have ‘ACAB’ tattooed on their knuckles? Or smuggle tobacco through the ferry port he is supposed to be keeping free of crime? The Trunk Murder case, finds Mowgley following a trail across the Channel which becomes increasingly littered with dead bodies. I thoroughly enjoyed meeting Mowgley. He's a little bit Sam Vimes, a little bit Dangerous Davies, living in a very Jonathan Gash style world. Deadly Tide not only defies convention, but has a great plot and storyline. 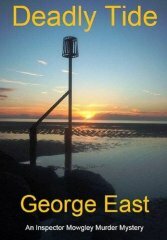 George has an excellent, refreshing style of witty writing and his characters are superb creations. The plot is intriguing and well thought out. So entertaining and visual. Great read. A jewel. So happy to have found this good book. Now I know what they mean by a pager turner! What a find! Simply gripping.